One advantage to having a brother-in-law visit for the weekend (especially one who is both an architect and has extensive experience with fabrication) is that you can ask him to help you with a project and it will get done quickly. 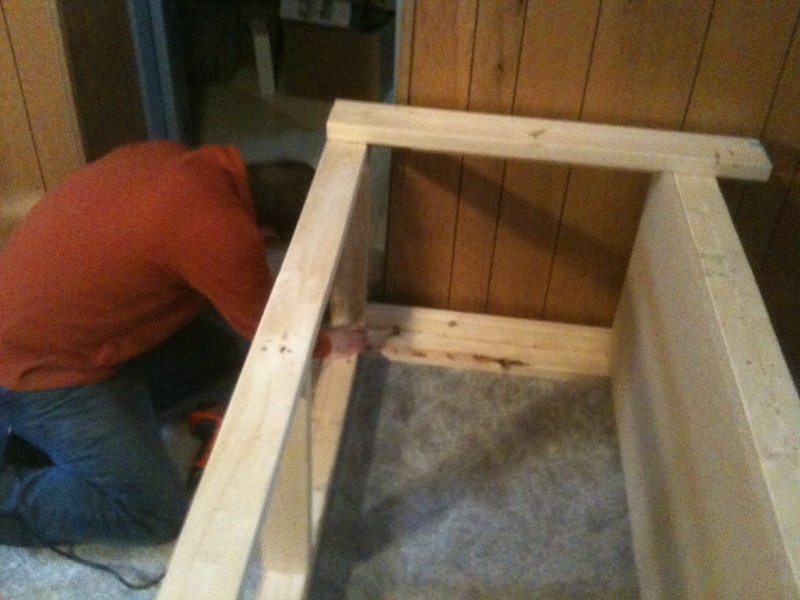 This weekend, Paul and I built a workbench for my office. It has been on my list of things to do since we moved in and the need for a workbench (for computer work) has only increased since we moved into the house over a month ago. All of that for under $100 and we were set to go … almost. I thought I knew where my corded drill was, but I was wrong (and now my wife keeps telling me I don’t have one, she’s probably right). So I headed out to get a cheap drill to get us through the day. I’ll be bringing it back to Target because the trigger sticks and it is terrible. One thing on my list is a decent set of power tools. With an extension cord, drill, pencil, tape measure and improvised straightedge, we got to work. It is better to just show you the progress. 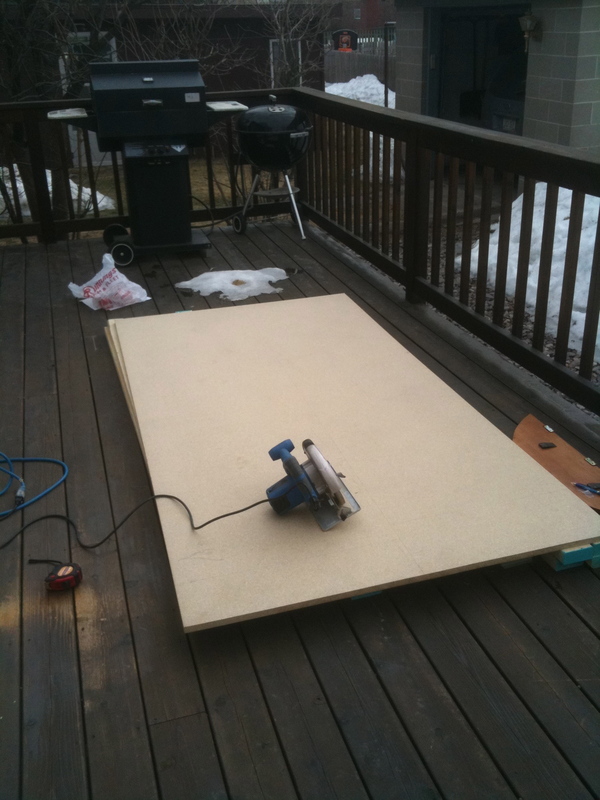 Prepared to make the first cuts on the high-density fiberboard. I really don’t have any tools, so we were using the studs as improvised horses so that we would not cut into the deck. 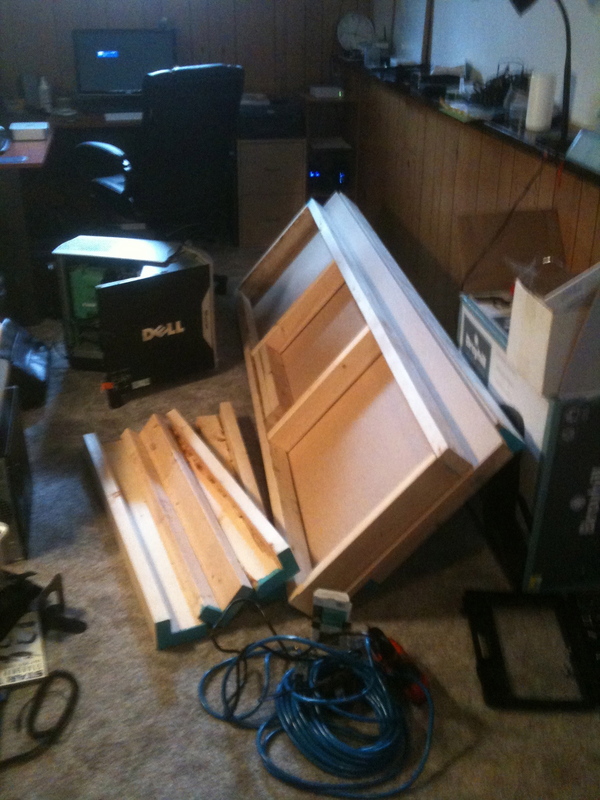 Here you see all of the materials in my basement office, read to finally get put together. Word of the foolish for those who don’t know: be willing to spend money on tools. It will make the whole project easier. What will become the lower shelf has a frame just like the top-level frame seen in the picture. The top of the workbench overlaps the L-shaped legs and gives it a really sleek look. Here Paul is putting screws into the frame for the top of the workbench. You can see the lower shelf already in place and providing the structure for the legs as well. Really easy to put together. This is the workbench as it stands right now. You can see the lower that is mainly used to house machines (and boxes for the moment). There is still some work I need to complete which mainly revolves around sanding and coating the shelf and top. I mounted a monitor on the wall for use on testing and debugging machines. 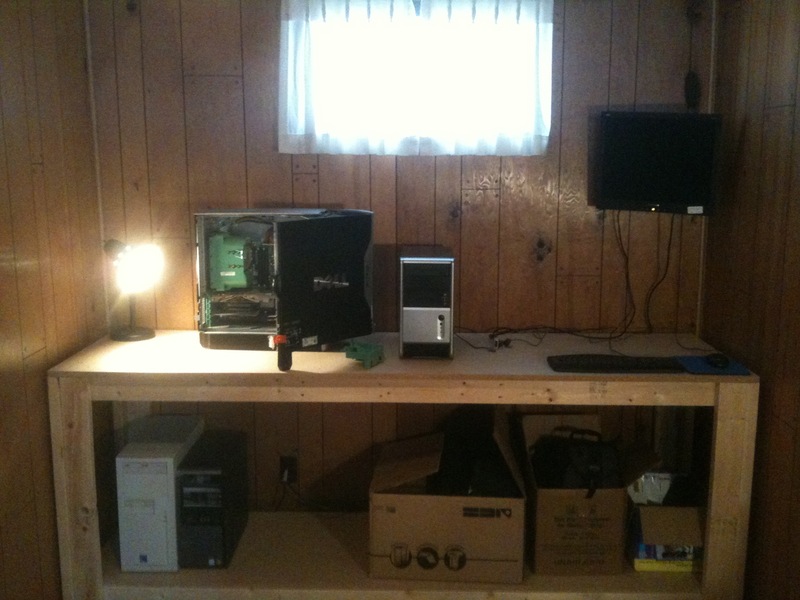 The workbench stands 38″ tall so that it is at a decent height for me to stand at and work on computers. It works quite well. I was able to put together my brother-in-laws new machine pretty easy. I need to figure out a lighting scheme for the area and also get some storage for tools on the wall or on the bench itself before I would consider it completed, but it is a huge step forward. A huge thanks out to Paul and my wife (who watched our son while I worked on this with her own brother)! Looks like a fun project guys! It is always more fun to do with some help. Yes it is. One deficiency I will need to fix is my lack of useful tools. That will change in the future.